These 12 inch black stripping pads fit directly onto our 24 inch automatic scrubber for large area stripping. Great for wide open areas! 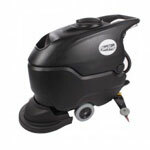 They can also be used with our 12" Oreck buffer for residential, or small area stripping. Especially effective when used with our stripping solution. Return to our complete line of floor stripping pads. Held up well Review by Me. Used this pad for 3 hours straight...didn't need to flip it over.